Company profile Japanese knife Nigara Forging Co., Ltd.
During the early Edo Period, the city of Hirosaki was a castle town. There were over one hundred forging shops in the area. Nigara Forging is one such historical Tsugaru blacksmith shops maintaining its history and art. It is thought that, here in the Tsugaru region near Mount Iwaki, major iron production took place during the Heian Period (794-1192). Artifacts made from iron used during Nara Period (710-794) and early Heian Period has been found around the city of Hirosaki, indicating there was a vast group of ironworks in the region. Additionally, the existence of Kaji-machi, which literally means the blacksmith town, is evident that it was a town of blacksmiths. During the early Edo Period, the city of Hirosaki was a castle town. It is said that there were over one hundred blacksmith shops in the area. 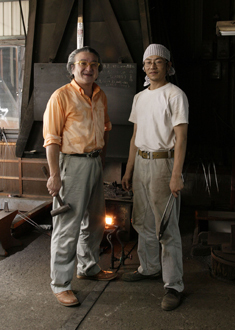 As a part of the proud Tsugaru Uchihamono blacksmith history, the Nigara Forging persists with its art. For inquiries, please use a Mail Form in the following . Since being appointed by the domain of Tsugaru to make Japanese swords, Nigara Forging has a history of over 350 years. As one of the few noble swordsmiths in Japan, we have continued to preserve this art. During the Showa period, Nigara Kunitoshi, a master swordsmith, was often recognized for his work. During the period of World War II, the traditional swordsmithing technique made its impression with the military prior to and during the war, but afterwards has been realigned to creating knives. Carries on the traditions of the castle town of Hirosaki-jo Castle. The making of swords has been abandoned as a business item since 1965, but the same forging techniques such as welding and hammering have been kept alive in the making of our Honuchi knives. One example, the Honyakibocho, a kitchen knife which is made only by steel, has a wavy design on the back after its crest, a striking and artistic feature. Such designs and techniques require intuition and skills developed over decades of experience. Our products were officially certified as Aomori Prefecture Traditional Crafts in December, 2007. Edo Period During the advance to Tsugaru plain (current city of Hirosaki) of Tamenobu Tsugaru, our company served as weapons producer, creating a variety of items from cannons to warships. Early Showa Period Hiroshi (Pseudonym Kunitoshi) Nigara learned under Mitsutaro Honda, Ph.D., the head of the Institute of Material Research at Tohoku University, marking an important step towards modernization. Kunitoshi Nigara excelled in the making of Japanese swords, and was recognized as one of Aomori Prefecture’s Living Treasures. His expertise as a blacksmith has been passed on to Toshihisa Yoshizawa (7th President). 1949 Converted to a Limited Company. 1959 Previous president, Shun Nigara studied at the Institute of Material Research at Tohoku University in order to incorporate modern engineering technology. 2000 Toshihisa Yoshizawa was installed as the president. Obtained the third factory.